The Tennis Villas are a gated community of condos in the Monarch Beach area of Dana Point, ideally located across from the St Regis Resort entrance off Niguel Road, and within walking distance to the Links Golf Course, the trails heading to the Salt Creek Beach and Park and the Ritz Carlton Resort. The Tennis Villas Condos at Monarch Beach in Dana Point offer a 'resort-like living', the 164 condos that compromise the community, share a community pool, spa and clubhouse and there's a tennis club membership available to the residents. 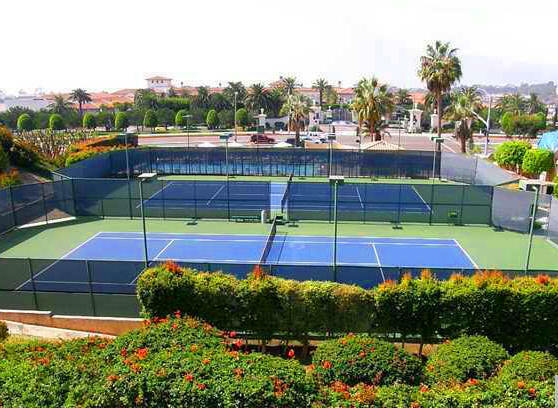 Search all Tennis Villas condos currently available for sale at Monarch Beach, including those listed as short sales and foreclosures. For more information about any of the condos, please contact us at (949) 888-6788, or visit our Dana Point Real Estate section for more homes in the city, or for more homes in the area, we created a Monarch Beach Homes section. Read more about the Tennis Villas Real Estate options. The Tennis Villas real estate options offer single story designs, of one or two car garages, and 1100 to 1450 sq ft in size. The condos have two bedrooms and two baths, and the community has a tennis club membership available to the residents. The beautiful gated entry sits just across from the St Regis resort, and the condos are a favorite because their location makes them have easy access to PCH, to the freeway via Stonehill road, and all the Dana Point and Laguna Beach amenities, as the neighborhood sits on the northen side of Dana Point. Gorgeous ocean views, golf course, or just nature, can be seen from the units. OCExecutives specializes in real estate transactions of Tennis Villas Homes in Dana Point, California. Contact us today to sell real estate or buy real estate in the Tennis Villas community of Dana Point or for more information about any of these Tennis Villas homes. If you would like to see a list of homes in other communities in Monarch Beach or Dana Point, follow the links above, or click here for other Dana Point Real Estate.